For chicken lovers! Make chicken chilli with its spicy flavor and Chinese twist. 2 tbsp chopped spring onion (for garnishing). 4 Mix all the ingredients well and then add chicken cubes. Ensure that the chicken cubes are coated well with the mix. 5 Grease the marinated chicken with ½ tsp oil. 6 Pre heat the Kenstar Air fryer at 180° C for 3 minutes. Arrange the marinated chicken in fry basket and close it properly. Keep the Air fryer at 180° C for 12 minutes. Remove when done. 8 On a low flame heat ½ tablespoon of oil. 10 In a separate bowl, mix the contents of the Knorr Easy To Cook Chinese Chilli with 450 ml water. Add it to the vegetables. Stir well and cook for 3 minutes. 11 Once the sauce is thick, add the oxy fryed chicken evenly. Cook for 1 minute so that the chilli sauce coats the panner. 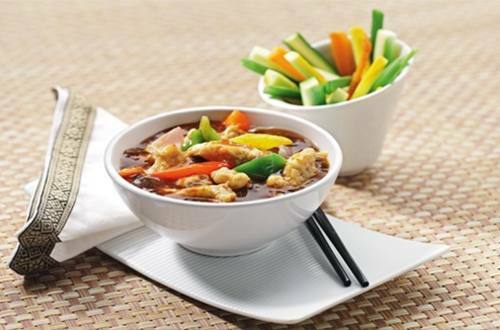 13 Enjoy this meal with Knorr Chinese Hot & Sour Chicken Soup.